Well now, who doesn't love diamonds? I'm a bling-bling girl myself ;p Although I don't have many diamond jewelry except for my wedding band and a set of jewelries that my mother-in-law gave to me but I still love to browse about jewelry, especially diamonds. Upon my browsing the other day I stumbled upon this website called ABAZIAS. When I got to their homepage, I was suddenly mesmerized and tempted to browse further at the website. That's where I found many beautiful diamonds in many shapes and designs such as the round cut, the emerald cut, the oval cut, the pear cut (my fave!! ), etc. They also have a selection of beautiful engagement rings, wedding bands, loose diamonds, earrings, bracelet, you name it.. The website is pretty easy to use too. You can search for what you need by price, carat, clarity and color. 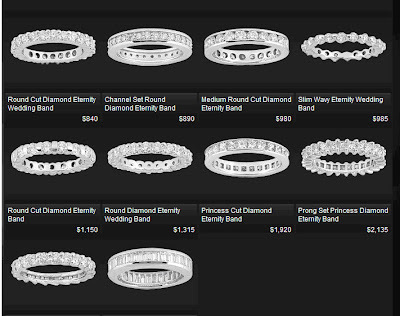 But my favorite feature at the website is the ENGAGEMENT RING BUILDER. Yes, that means you can actually design your own dream ring ! They claim that they can offer us a stone tailored to our exact needs and our exact preferences, meaning that they don't limit our choices. And that's true. I have tried the engagement ring builder myself, the navigation is easy, you build your dream ring by choosing and combining the many available choices of diamonds and settings, then you can see the preview including all the details and price. That way you can order your ring without having to over-budget yourself. They also have lots of diamonds information on their website so it was a really good time for me to visit their website (and drooling on all their diamonds and jewelries). HA THAT IS SO COOL! Actually before I got married, my then-boryfriend now-husband went to a store in the UK called the Ringmaker which allows you to design your own rings (anything from normal rings to engagement ones). I thought it was the smartest thing ever and my sis-in-law ended up getting a ring there as well. It's great they're doing this online, though I'd probably never buy jewelry that expensive without seeing it first!